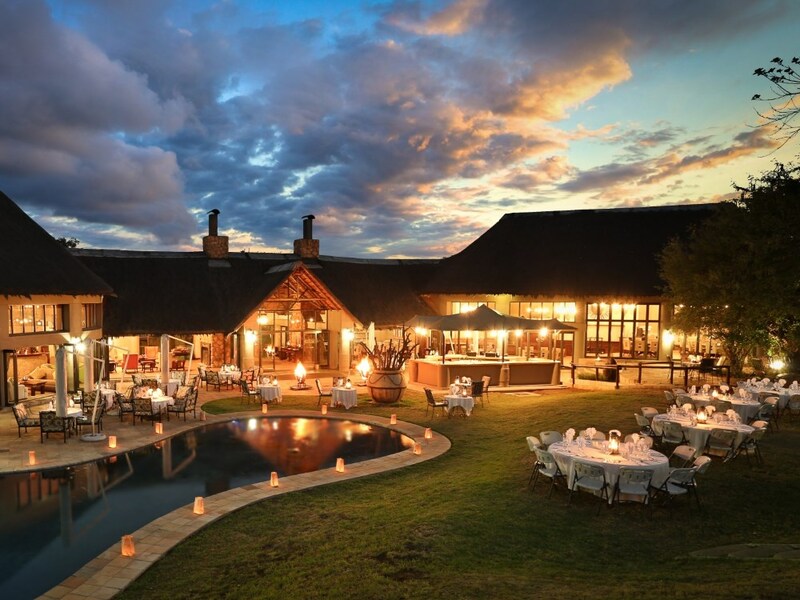 This reserve is close to Johannesburg, malaria free and family friendly – therefore it is the ideal spot for couples or families looking to get away for a weekend! For something completely different go hot air ballooning or try your hand at archery! Just outdoor showers in the suites so you could get chilly when it’s cold – or soak in the large bath of course! The 64 rooms are all separate standalone bungalows that snake away on both sides of the main lodge building and you’re likely to see the smaller buck that take refuge inside the lodge’s fence wandering in between the suites! 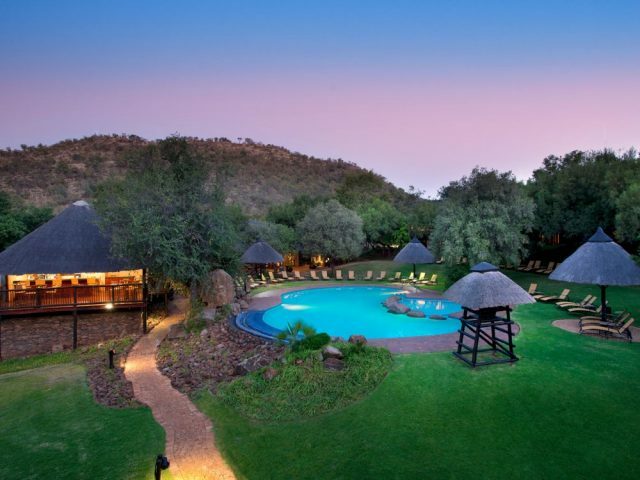 Set in the north-eastern sector of the Pilanesberg and accessed via the Bakgatla Gate, Ivory Tree is an easy two and a half hour drive from Johannesburg, so if you fancy a quick weekend break in the bush this could be the place for you. 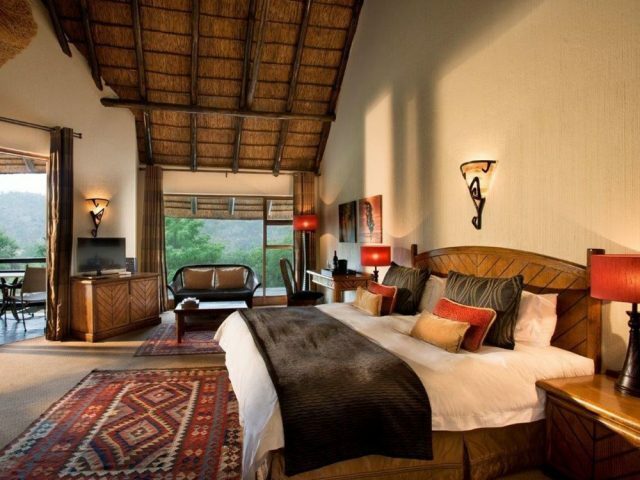 What you do need to be aware of though is that this isn’t your typical small and rustic traditional game lodge as dominates most of the portfolio here at Bushscapes – rather it is a very large 64 room “bush hotel” which offers a completely different, more “resorty” experience that will suit certain travellers, but not others. The public areas of the main lodge have been carefully planned to ensure easy flowing and comfortable spaces designed to accommodate a larger group or to provide intimate retreats ensuring privacy for couples or families. You can also enjoy two lounges, as well as a bar and cocktail lounge for those of who would like to enjoy a sundowner on the main deck. The central areas were designed using a double volume style to ensure impressive views of the surrounding amphitheatre. 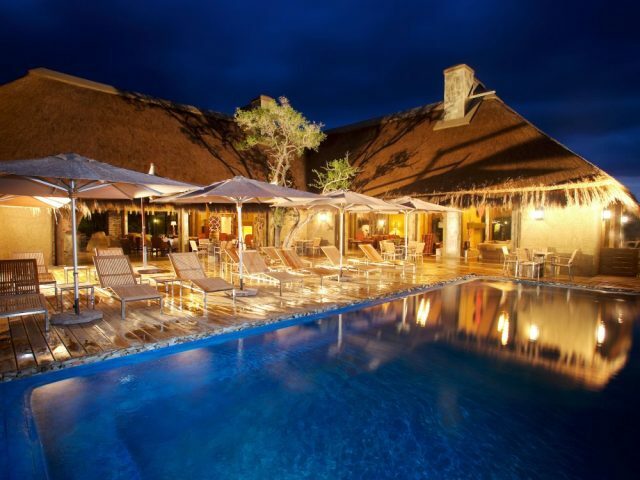 The highlight though has to be the large swimming pool which has been positioned between the lodge and the newly completed water hole – so you can enjoy a spot of game- viewing without even moving from the water! Talking of game viewing, you will enjoy twice daily game drives in 10-seater open game vehicles with your experienced ranger who will share stories and facts about the surrounding wildlife that will keep you on your toes and wanting to hear more! 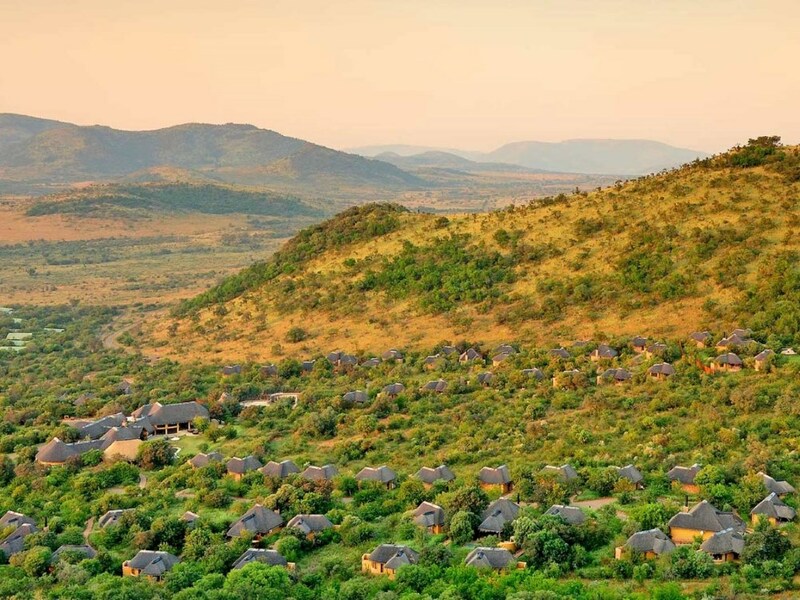 One thing to realise is that although Ivory Tree has its own private area, the rest of the Pilanesberg is open to the public so you don’t have the true feeling of exclusivity on offer at lodges in other reserves – the policy here is also to stay on the roads at all times, unlike the lowveld reserves for example where you can follow confirmed Big Five sightings off road. The good news though is that the Pilanesberg boasts an abundance of wildlife in its 580 square kilometres of diverse and rugged bushveld terrain - the park is home to Africa's Big Five, over 300 species of birds (some are migrant and others permanent inhabitants) as well as a wide variety of rare species like the fleet-footed cheetah and the majestic sable, so keep your eyes open! Other activities for you to enjoy at Ivory Tree while on your down time is to relax around the main pool or for some real self-indulgence enjoy a massage at the exclusive Amani Spa! At this lodge you don't have to worry about your little ones – here they can go on bush bumbles with rangers or you can all enjoy a family safari together. For those avid bird lovers you can book a bird drive, which is tailor made to suit everyone from novice to experienced bird watchers. Otherwise for those looking for a little bit more of an adrenaline rush, why don't you book a hot air-ballooning trip over the park (what could be better than sipping on a glass of bubbles while watching the game meander through the park from above) or take an elephant back safari? Of course, the golf courses and gambling tables of Sun City are pretty close by too!